For this post, I have put together a collection of the best laser levels currently available. Traditional levels have been around for many years, while still an essential part of any toolkit, laser levels offer many advantages. The laser projects bright horizontal, vertical or cross lines onto flat surfaces with extreme accuracy. It will also self-level, typically when positioned within four degrees of level, depending on the manufacturer. 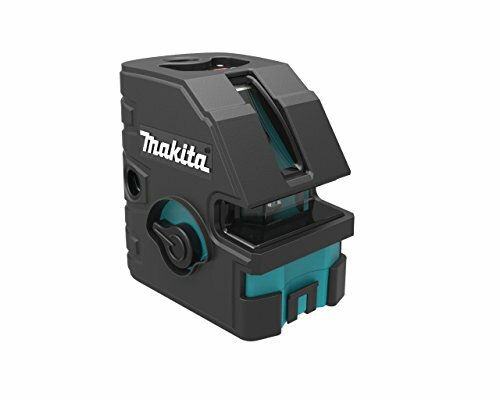 When required, you can also enable manual mode allowing you to project lines that are not level or plumb. Use mounting clamps that easily attach to a variety of surfaces for completely hands-free operation. The following levels use the latest innovative components to meet your needs and help to ensure you do your best work. So here is my list of The 10 Best Laser Levels. Self leveling cross lines that projects bright crossing horizontal and vertical lines. Integrated magnetic bracket allows for flush attachment to metal track and steel. Integrated magnetic bracket with 1/4” and 5/8” thread rear.mounted magnets allow flush attachment to metal and steel track. 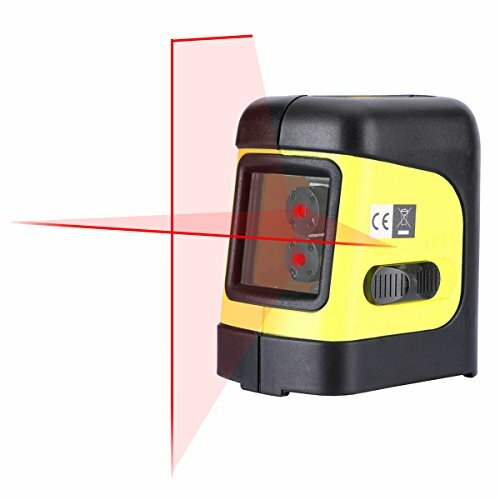 Highly visible laser lines - wide 130 degree horizontal and 160degree vertical fan angles. Smart pendulum system - self levels and indicates out-of-level condition; locks when switched off. Pulse laser receiver mode - for use with LR2 laser receiver at up to 165 feet in all bright-light conditions. 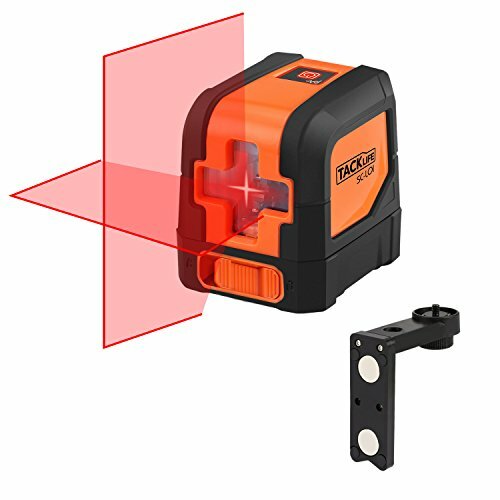 BM3 positioning device includes micro-fine height adjustment, retractable feet, 1/4-Inch-20 tripod thread, strong magnets and a screw hole. Class IIa laser product, <1mW power output. Ultra bright 360-degree vertical and 360-degree horizontal green beams. 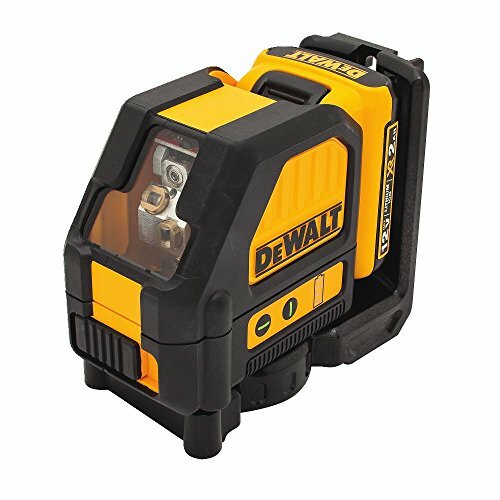 Provides all-around leveling coverage with and accuracy of ±1/9 of an inch at 33 feet and a maximum working range of 150 feet, enabling you to work in different parts of a large room simultaneously. Green laser is 2x brighter than red laser with the same light source, still accurate and clear in daylight. One button operation makes it easy to project lines together or independently (cross line, vertical and 360-degree horizontal). Smart pendulum system, the pendulum locks when the level is switched off. The 902CG Laser Level is both waterproof and sturdy to ensure that you can rely on it in any working conditions. 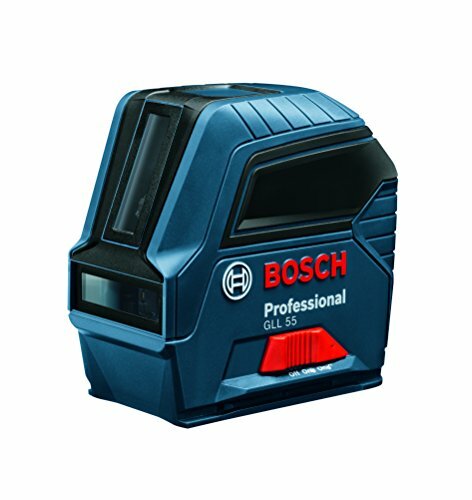 Features Bosch’s Visimax technology to deliver maximum line laser visibility up to 50 feet in standard working conditions. Can project two lines independently or together. To provide secure transport, system locks the pendulum when it is turned off. 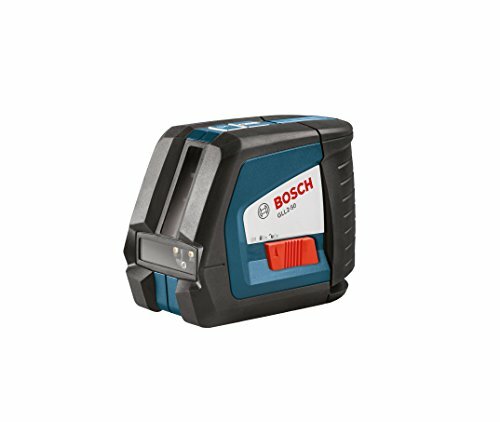 This line laser is IP54 rated to withstand tough jobsite conditions such as rain or dust. The included magnetic L mount features strong magnets to attach to steel. Line visibility range up to 50' depending on ambient light in working environment. Accuracy - horizontal line (+/- 1/8" at 30'); vertical line (+/- 3/32" at 30'). Self-leveling is correctable up to 4 of slope allowing operation on uneven surfaces. Maximum radiant output power for classification is 0.95 mW. 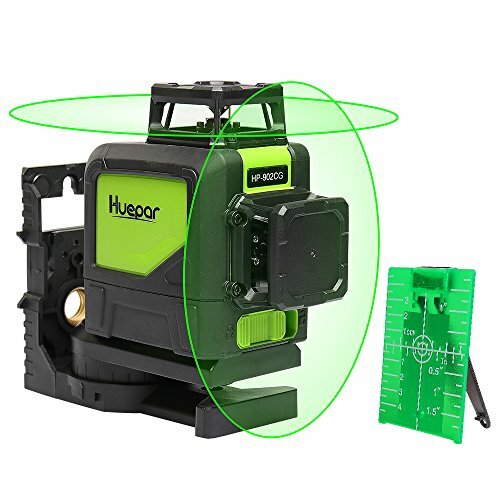 Combines a horizontal and vertical crossline laser level with a plumb dot tool (for accurate floor-to-ceiling alignment of two points from across the room). Compact, durable and weather/dust resistant. Fits a standard tripod with 1/4” screw or construction tripod with 5/8" screw. Super strong magnetic heavy duty bracket ensures level stays firmly attached to vertical stud or pipe. 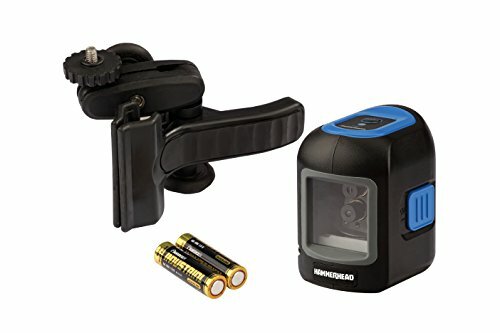 Quick release button option allows you to easily remove clamp to move position. 180˚ swivel mount makes it easy to check horizontal levels and ensure objects are perpendicular to each other across room span. Projects bright horizontal, vertical or cross lines onto flat surfaces with the accuracy of ±1/4 inch at 30 feet. Self-levels when positioned within 4 degrees of level. LED indicator turns red when the unit is positioned outside of the self-leveling range. 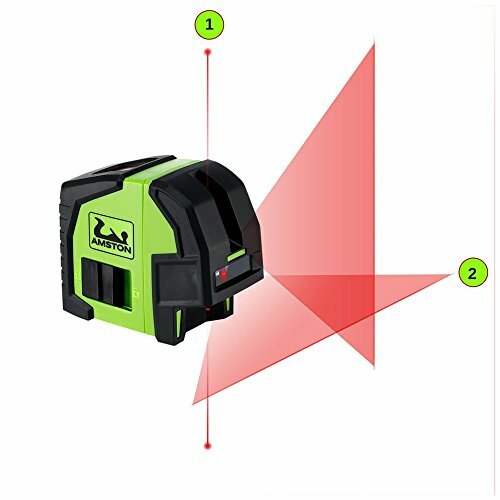 In the lock (manual) mode, the cross line laser can be positioned to project lines that are not level or plumb for projects that require them. The included adjustable mounting clamp easily attaches to a variety of surfaces to extend the utility of the tool. The cross line laser may also be mounted on any 1/4" threaded tripod screw. Fully functional, two laser tubes can alone provide more bright and accurate horizontal and vertical laser line. Self-leveling function,range is 4 degrees. The laser beam will flash quickly when the unit outside of 4 degrees. Magnetic bracket offers more possibilities of use, it can adsorb on the metal or mount on 5/8" tripod. Easy to use, compact and lightweight, it can help you easily to finish home-renovation project, as installing floors, framing, laying out tile, and hanging pictures, etc. Pendulum unlocked to activate laser beam, it auto-levels when placed within 4 degrees of horizontal/vertical. Project lines in any position or angle or adjust the height from the tripod. Emits and projects a laser cross line onto flat surfaces with high accuracy of ±1/8 of an inch at 30 Ft, works best indoors. Ideal for tile alignment, wall studding, windows, doors, etc. Compact and lightweight for easy gripping, but large enough to be stable. Equipped with a nylon zippered pouch, to prevent dust for storage and protects the level and L base against damage. Projects bright, crisp plumb and level lines across a 200-Degree field of view. 90-degree lines which can be projected at any angle. Accurate to 3 mm at 10 meters (1/8 inch at 30 feet). Fast settling, self-leveling gimbal quickly gives you accurate reference lines. 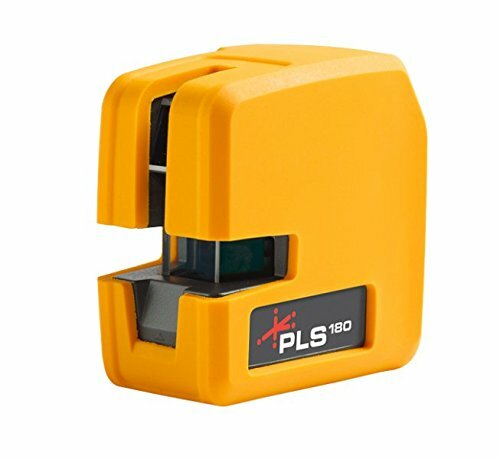 I hope this list of the best laser level was helpful.